The Engel 39 Litre combi fridge & freezer features a thermostatically controlled fan & ducting system to ensure the fridge compartment maintains a temperature range of +2 to +5 degrees. 3. Remove the divider and have 40 litres as a fridge. NB: There is no option for this model to be all freezer. This unit also features the integrated control function previously only available in the Gold 50th Anniversary model and also has a built-in battery monitor with low voltage cut out at either 10.5 volts or 11.5 volts. Cabinet sizing remains the same as the original MT45F models to enable you to use existing accessories. 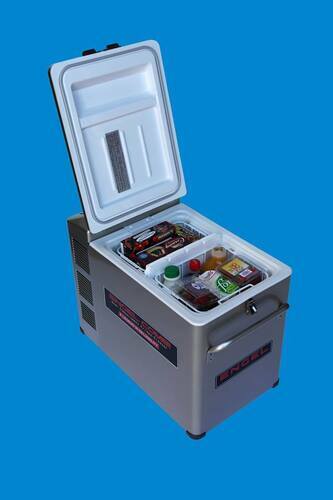 Price: $1449 fridge only RRP $ $1325 with genuine Engel transit bag valued at $235 included free of charge. Phone or email for your Special Price.